Gauge 1 requires a track gauge of 1¾ inches (44.45mm) which is generally referred to as 45mm. 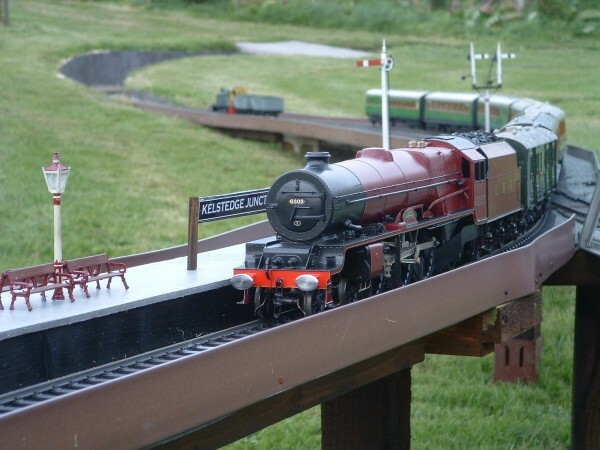 In practice this means Gauge One models are from one to two feet in length (300mm to 600mm); 50% longer than O gauge models and 50% shorter than “3 ½ inch”. This in-between position means the hobby is influenced by both model railways and model engineering; at its best it takes the concern for prototypical system accuracy of the former and the authenticity of the latter. Traditionally, enjoying the hobby of model railways means taking pleasure in the construction of a working diorama: either a scale replica of a real railway or a creation of the imagination. To this end, participants lay lines, adapt or scratchbuild models, and construct scenery as well as operate their layout. The generous model proportions of Gauge One compared to N, OO/HO and O gauges requires a different approach. Space is usually at a premium, especially for an indoor continuous loop to suit live steam. The usual minimum radius is 10 feet (3 metres), although be assured that many models will make it round a 2 metre radius and note both radii are very tight by full-size standards. However, when viewed from the inside of a tight curve as is usual, the appearance is surprisingly palatable and the absolute distances involved serve to somehow soften the effect. Line length varies from around 20 metres up to an astonishing 300 metres in one well known garden which features gentle curves with radii of 20 feet (6m) and above.